Kilograms, centigrade and convection, Oh My! 24 November 2016. We are celebrating this most-American of holidays in Seattle with pouring rain, but surrounded by family. I am the chief cook but thanks to two able sous chefs, Ric and my sis-in-law Deb, I am not spending the entire day in the kitchen. Our nephew is supplying excellent wine and Alexa, the digital assistant will play any music I desire on demand. She also sets timers. I have fallen in love with her and a few minutes ago ordered one for our house. 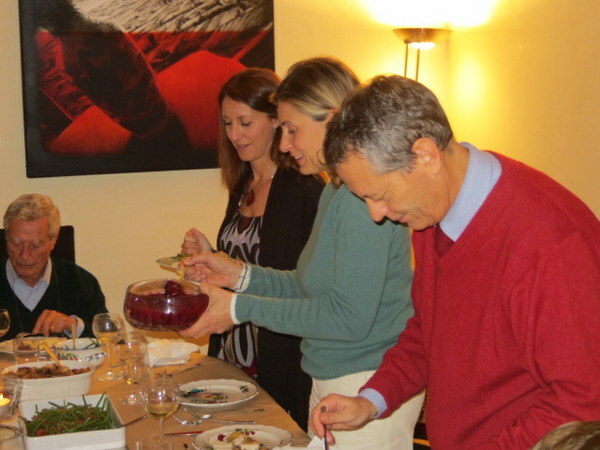 We are grateful to be back in the U.S. for the first Thanksgiving here in 5 years, but cannot help taking a look back on a fun-filled feast we held in Italy in 2013, when Ric and I cooked for 11 Italians on Thanksgiving. I hope you enjoy the look back and wish you all a very blessed holiday. I’ve prepared a lot of turkeys. A conservative estimate would be that I have prepared 40 over the course of about 36 years. My first was when I was in my mid-twenties and decided I had to be the hostess for Thanksgiving and my mom had to help. I was terrified of ruining the Butterball. The years we did not prepare a turkey for Thanksgiving at home I surely made one for Christmas or sometime during the autumn. And I graduated over the years from frozen (Norbest with a built-in timer!) to all-natural farm-raised turkeys from an organic store. 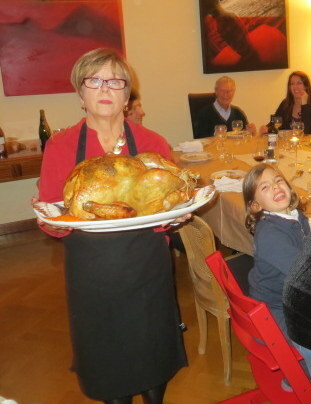 But the most satisfying turkey-venture was this year, in Rome. Leonardo reads the menu – in English and Italian – as we start with the soup. 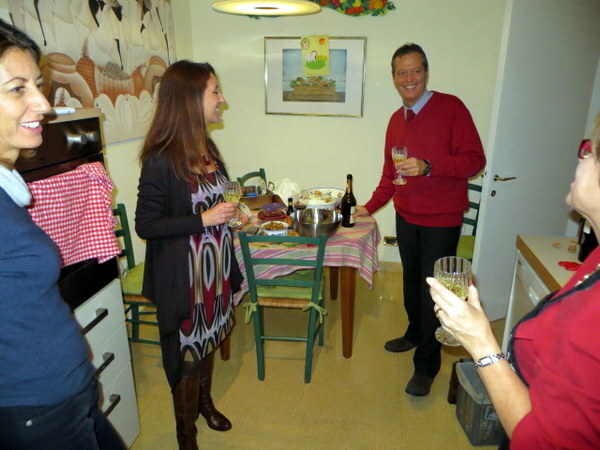 Our friends, Alessandra and Francesco, invited us to prepare the feast in their beautiful apartment. 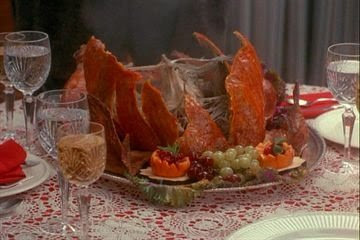 They would provide the turkey and wine while Ric and I would prepare the contorni (side dishes). Knowing they had an Italian oven, which are smaller than most we have in the U.S., and since this type of meal is a bit unusual in Italy, we gathered over supper the Friday before Thanksgiving to plan our attack. I warned them that turkey takes time: I will be in your kitchen much of the day. Since Thursday was a work-and-school day here for all but employees of the American Embassy, I worried it might be an imposition. But Ale and Francesco were undeterred and in fact invited a crowd to experience the American feast. There would be 11 Italians at the table, plus Ric and I. We decided that if it would fit in their oven, a 7 kilogram turkey would be a nice size, about 15 pounds U.S. Their friend Stefania would provide dessert. 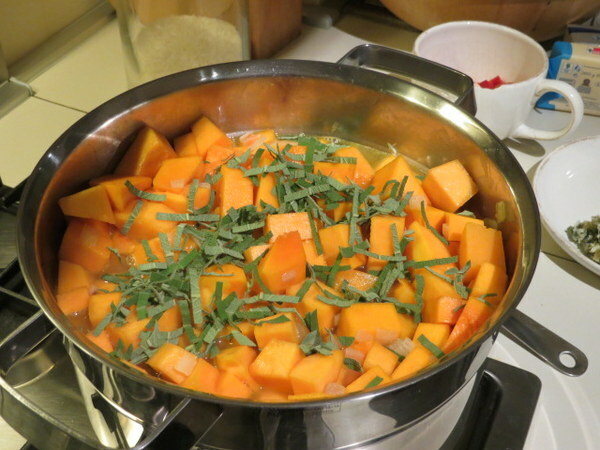 Beautiful butternut squash and fresh sage on the way to making a velvety soup. Early Thursday we headed out to pick up artisan bread for the dressing and fresh green beans, managing to get in a 6 km walk in advance of the feast. While we were inhaling the glorious smells at Roscioli, Francesco called and said “You need to talk to Ale. She has the turkey and it’s big.” Ale confirmed: her butcher has provided an 8 kg (17-pound) hen turkey and the butcher says it will take 5 hours to cook. Can we come earlier to start the cooking? 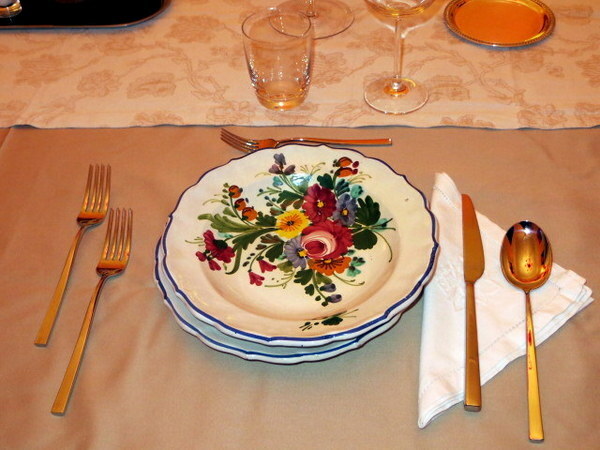 Ale’s elegant tableware from Castelli, famous for ceramics. We planned to serve the soup at 19:30 and the main course about 20:30, so we figured the bird needed to go in the oven about 16:30, if it weighed 7 kg. Now we had 8 kg to deal with, and (surprise!) a convection oven, which changes the cooking game considerably, plus the butcher’s recommendation to cook it in a low oven for 5 hours. Yikes! Arriving about 14:45, Ric set to chopping herbs for my herb-butter turkey recipe. By 15:20, after calculating and re-calculating cooking time and centigrade-versus-Fahrenheit, we had herb-butter under the skin and put her in the oven trussed up as tightly as we could, just managing to squeeze her into the space available. (Ric has a wonderful little app on the tablet that does all manner of conversions since our American-system brains have to constantly deal with length, volume, temperature and distance conversions.) With any luck, she would be done by 20:00, giving 30 minutes for “rest” and to make the final prep. Every good dinner starts with prosecco. From left, me (elbow), Rita, Valentino, Francesco, Eleonora and Nello. number of hits! Who knew? Survey says: aluminum foil, low low temp (about 200F), and moisture in the pan beneath the turkey. Can I tell you this was the most beautiful turkey I’ve ever made? And the moistest? And the best-tasting? My updated recipe for perfection at Thanksgiving = The company of people you enjoy + Natural Italian turkey + Convection oven + Creativity and a little experience with turkeys. Ignore the goofy-looking cook and focus on the bird: perfection!! Sara clearly finds me amusing. I think the only side dish quite familiar to the guests was mashed potatoes. Gravy is not normally made in Italy, nor dressing/stuffing as we do in the U.S. (mine is made with sausage, apples and raisins). We managed to acquire fresh whole cranberries (shipped in from Massachusetts) and made sweet potatoes with gorgonzola. Stefania’s tarte tartin and homemade whoopee pies made for a festive and tasty finish. See the whole menu here. Multiple portions were consumed and even the kids were adventurous in trying foods they’d not seen before. No one seemed to miss pasta. Everyone who has prepared a big turkey dinner knows that the final prep is chaotic, getting stuffing, potatoes, sweet potatoes, veg, gravy and turkey all on the table at the same time. Ronnie is a blur as he speeds to help. Thanks to Ronnie, Ric was off clean-up duty for a change. Last year, our first Thanksgiving in Italy, we knew we would really miss the large crowd we tended to gather around our table in Portland, so we celebrated in a totally non-traditional manner. This year we had a memorable, wonderful day thanks to Alessandra, Francesco, their family and friends. We are very grateful to have been able to share the traditions and spend our holiday with them and to them for opening their home and kitchen to the American Invasion. I am so getting a convection oven the next time we need to buy an appliance. 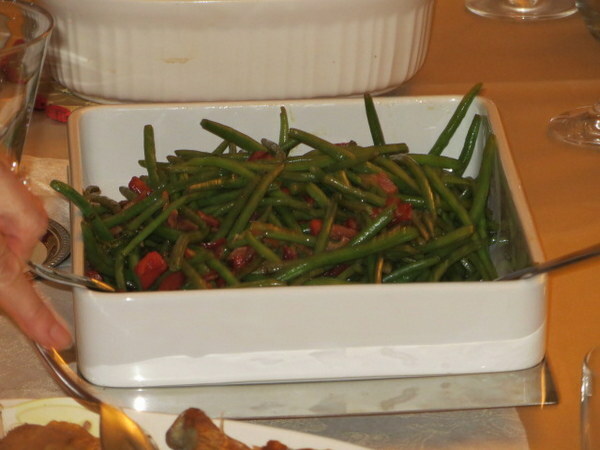 Thanksgiving green beans with red peppers and American bacon. Not your mother’s green bean casserole. Giordano, Leonardo, Giuseppe and Sara, doing what kids usually do after dinner. 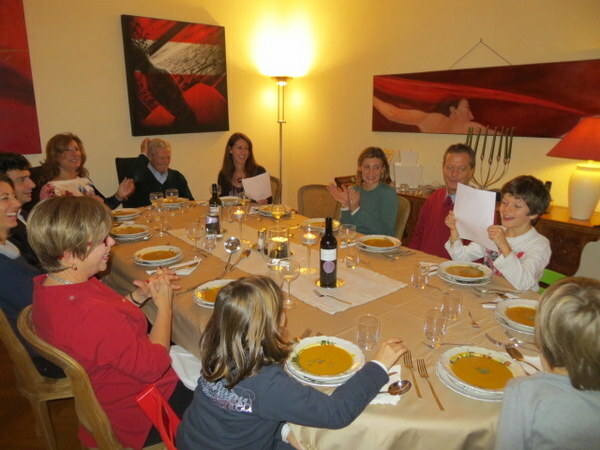 Giuseppe and Giordano at table – even the kids liked the soup! 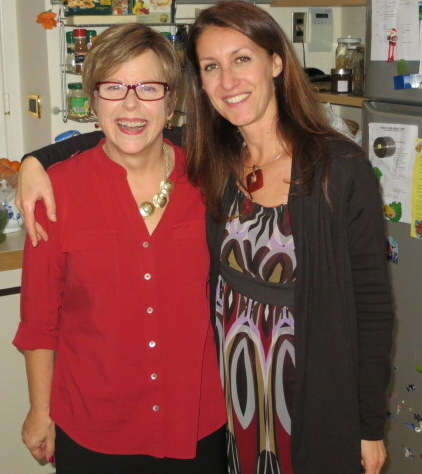 Me with my friend and Italian teacher, Eleonora. Kitchen action stops fo a quick pre-dinner drink. Ale, Eleonora, Francesco and me. 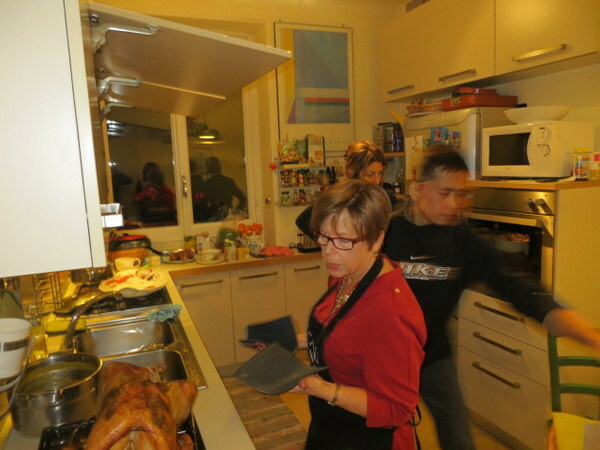 In the U.S., our Thanksgivings were usually over-the-top: 13 people in our tiny condo for a 5-course meal, for example. This is definitely the holiday I miss most living abroad and replacing our U.S. traditions just doesn’t fit. So we do Thanksgiving differently. One year it was a non-traditional hike. The next we cooked dinner for 11 Italians at our friends’ house. Last year we fed ourselves on American nostalgia by touring the Norman Rockwell exhibit that was here. This year, we celebrated twice, because once is not enough. A week prior to T-Day, the American Women’s Association of Rome held their annual Thanksgiving dinner and we joined about 110 ex-pats and Italians for an Italian-ized dinner at the ever-so-elegant Hotel Hassler. If you want a room there tomorrow night you would pay €330.00 non-refundable for the smallest room. For only an extra €100.00, you do not have to pre-pay and get breakfast too. Such a bargain. Personally I’d prefer a 3-night stay in a cute B&B in Venezia. Elegant table setting at the Hassler. 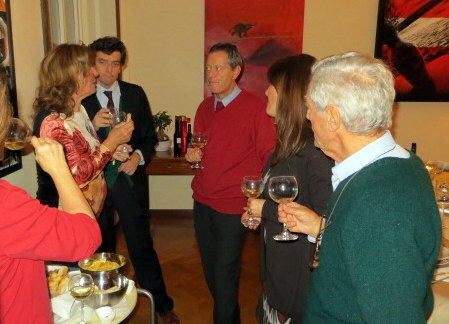 The AWAR dinner was beautifully prepared and served with prosecco and wine flowing freely. So freely I had to put my hand over my glass a couple of times to prevent the constant topping-off. As I said, the menu was Italianized. Of course, there was a pasta, in this case perhaps the most delightful lasagna I’ve ever eaten, made with pumpkin and porcini. It was my intention to NOT complete each course, to pace myself and not overdo it. I managed to do so with the soup, but the lasagna demanded to be eaten. If there had not been 10 other people at the table, I might have finished off Ric’s too. (Note bene: all of the Italians finished their pasta. I was just trying to blend in.) While on the menu it looks like we had five side dishes (Brussels sprouts, sweet potatoes, corn, apple/soy cabbage, and chestnut with baby onions), in actuality only the sweet potatoes were a portion; the other four were a melange, more of a garnish than a vegetable dish. OMG to-die-for lasagna of pumpkin, mushrooms and almonds. Italian take on a Thanksgiving dinner. The little garnish including the Brussels sprouts and corn at 12:00 on the plate comprised of 4 individual items on the menu. The dessert buffet was insane and totally Italian. I managed — only being polite — to down a wedge of something intensely chocolate. We finished the evening with a visit to the rooftop for a moonlit view over Roma. Fabulous. Our “second Thanksgiving” is barely underway but is decidedly low-key. Setting up the house for Christmas, watching a movie or two (last night, the annual viewing of Planes, Trains and Automobiles), and later dinner with friends at a favorite trattoria. May those of you who celebrate this great American holiday have a truly blessed day. We look forward to hosting one of our classic dinners when we return to Portland. Dessert buffet: no pumpkin pie in sight. Roma by moonlight from the Hassler, above the Spanish Steps. It has been a long time since I posted to Good Day Rome. How to catch you up on our busy month? We started with an outing on Ognisanti (All Saints’ Day) November 1. It was a spring-like start to November and we were not alone, but it was divine to walk among the ancient aqueducts yet be so close to home. Click on any picture for a larger view. Parco dei Acquedotti, Nov 1 2014. From afar, disconnected arches of an ancient aqueduct. Closer, an even older, now-buried aqueduct, appears as a stream. Just as massive as you would imagine. Walks, runners, cyclists all enjoy the day. A waterfall that originates in the stream of one of the ancient aqueducts. Ric had a couple of eye doctor appointments, including one with a doctor who specializes in the vitreous gel of the eye and the retina. (Narrow focus.) This doctor said no further treatment was needed (yea!) but that he should have frequent check-ups. Va bene. In sharp contrast to last year’s memorable and wonderful event, we choose to spend a quiet Thanksgiving this year: no cooking. I made a turkey breast on Sunday prior and we ate some excellent meals during the week, but on The Day we ate a decidedly Italian lunch at our favorite trattoria, following a visit to the Norman Rockwell exhibition that is currently in Rome. Outdoor dining, Thanksgiving 2014. Salute! ‘Tis the season for artichokes, here “all giudia” quick fried and crunchy. Roast lamb – a nice change after three days of turkey, at Antica Taverna. We hardly recognized Antica Taverna when we arrived for lunch on Thursday! We have been eating there for years, 90% of the time in their delightful outdoor area, under the sky in summer and in the enclosed, heated “annex” in winter or rain. The Mayor of Rome, Sindaco Marino, has waged war on what they call tavolino selvaggio or “wild tables,” and has made the restaurants in the centro storico pull their tables to a minimal protuberance. The motorini can go through and cars can pass through the ZTL practically knocking pedestrians out of their way, but the tables have to be cut back. Even in Piazza Navona they have receded. This new regulation severely restricts the small restaurants like AT that have more than 50% of their seating outside. Jobs were lost in this stupid move, but I doubt Marino will be mayor for long so perhaps the tables will go wild again. I also started a new blog, Our Weekly Pizza, to chronicle our ongoing mission. Please take a look. If you like you can subscribe, or you can find it on Facebook , Google+ and Twitter. We are wrapping up November with Christmas preparations. The holiday movie season kicked off with our annual viewing of “Planes, Trains and Automobiles” on Wednesday, and our extensive collection (I think 28) Christmas movies is queued for viewing. The apartment is decorated except we do not yet have a tree. Hope to pick one up tomorrow. (Much more of a challenge than you might think.) We have two trips coming up as well: Venice in early December and hiking in the Dolomites over Christmas. I will be sure to post some photos from those expeditions. What have all of you been up to? The older we get the faster time seems to move. (It’s an actual phenomenon that has been scientifically proven: the older you are the faster time seems to pass.) Only yesterday it seems we were dying of the heat in Rome, taking refuge in the mighty Dolomites enjoying brisk mountain air and alpine meadows. But that was July. Looking back over our time in Rome – now 19 months and counting – we have experienced so much, and yet my list of to-dos in Rome (not to mention all of Italy) has more things on it that we have not accomplished than ones we have managed to check off. There’s a wonder around every corner and we shall never get to all of them. Roma: Una vita non basta! New Year’s Eve Vespers with Papa F! We were right on the aisle. Ric snapped this pic with his phone. We managed to see a bit more of Italy this year, visiting some old favorites as well as new territory. March saw us in Sicily for our 28th anniversary, where we were constantly cold, but where we ate magnificent food and saw our first-ever Greek ruins. Stunning! Must go back in warmer weather. In May we ventured to the heel of the boot, Puglia, with my brother and sister-in-law. More great food, a fantastically different Italy, and lots of kilometers covered. Can’t count the bottles of wine consumed. Rick & Jane, we had so much fun with you those 10 days in Rome and Puglia! And we “discovered” Abruzzo on our way back to Rome. Wow! In fact we were so enchanted with Abruzzo we went back for a weekend in July. Not many North Americans (or non-Italians) go to Abruzzo as it is not chock-a-block with must-sees, but it is an amazing place to escape the city, practice one’s Italian, and relax. Later in July was our week in the Val Gardena. If only we could figure out a way to live there all summer. Like most Italians, we got away for Ferragosto but only as far as Orvieto for a couple of nights. It’s always nice to get on a train, and only an hour away is this charming Etruscan hill town. Our youngest son came to visit in September and we made our 4th trip to Venice in less than three years. Three days there flew by and in wonderment Derek observed we still had not seen everything we intended to. Venice has a lot to offer and so many people try to “do” it in 2 nights and one day. We’re going back for the 5th time in April with friends who have never been. The Cinque Terre calls to us each autumn and we made our third trip there in October. Hoping we can squeeze in a weekend there again in 2014. After the Marine Corps 238th Birthday Ball in early November, we made a trek to Ravello just as the town was closing for the season. This is a must-go-back location sometime during the concert season. Kids, don’t try this at home. 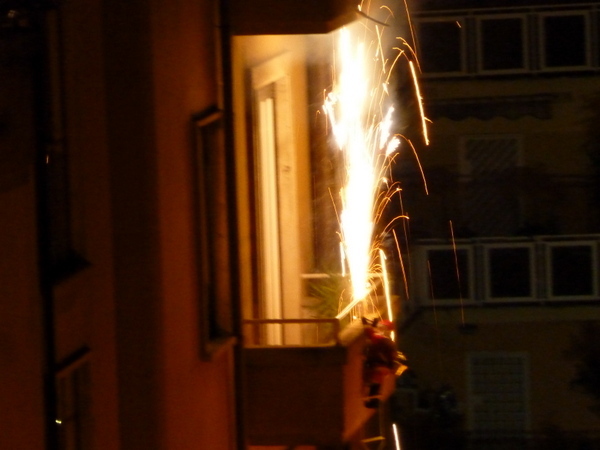 Our neighbor across the street shot off Roman Candles from his oh-so-tiny balcony on NYE. Note the Santa figure climbing a ladder hanging from the balcony. And this goes on all over the city! I turned sixty. Can’t believe it, but my mother is there in the mirror every morning, so I guess it’s true. We had a blind date with Nigel and Carol, new friends from England that we met through the Rick Steves’ Helpline and this blog. Hoping to see them again in February! Made Thanksgiving dinner for 11 Italians. We had so much fun doing this! I only hope they will let us do it again next year. Seeing our youngest son (not very young anymore, but still il mio bambino al cuore) after 16 months away. Getting fit(ter) in the gym. I’ve lost about 45 pounds since moving to Rome and had to buy a whole new wardrobe last summer and again this winter. Becoming more comfortable speaking Italian. I am “advanced intermediate” (B2/C1 for those that understand the scale) according to my teacher. I should be fluent by the time I am 85. Seeing Tom and Karen, our in-laws, when they visited Rome after their cruise. New Years’ Eve Mass at St. Peter’s Basilica with Papa Francesco. 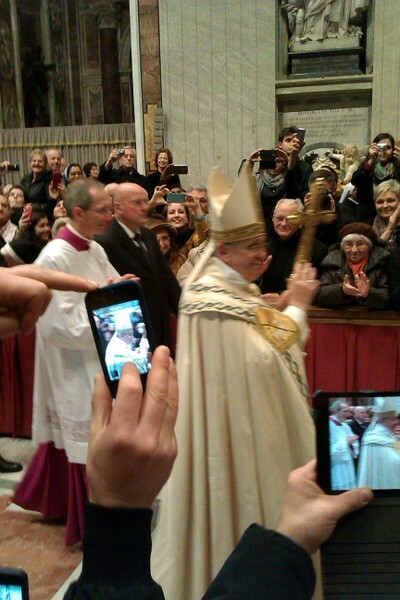 He was right there, not 2 meters from me during the processional and recessional. The energy in St. Peter’s was palpable, the love for this man overwhelming. St. Peter’s, NYE 2013. 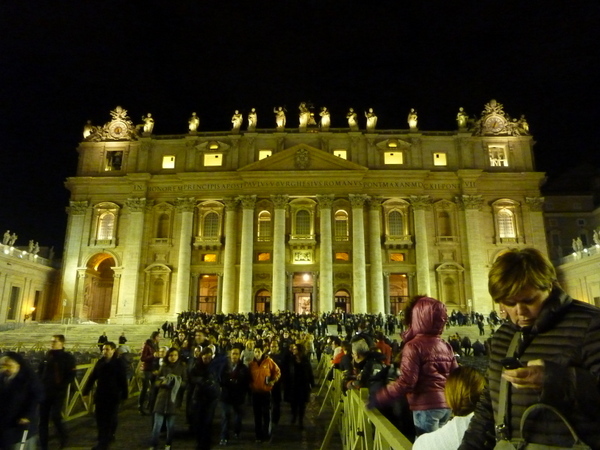 I read today that shortly after we left Papa Francesco came out in his Popemobile to see the Nativity in the square. Purtroppo we had left the scene! Italy for the first time in 19+ months. The sun is just coming up, outlining the Apennine Mountains in gold. We are headed to Switzerland where, magari, we will do Winterwandern (alpine snow hiking) to wear off the cheese fondue we plan to eat. We have many trips planned this year including a return to Venice, the Dolomites, Florence, Lake Como, and Abruzzo. We have guests coming, too: Kim, John and Aubrey in April; John, Susan, William and Elizabeth (aka JSWE) in July; the Omaha Bartons in August; a return by Derek in September; Rick and Jane in November; and hopefully Helen, Eddie and Debbie will make it over too. Anyone else? Would love to see you!